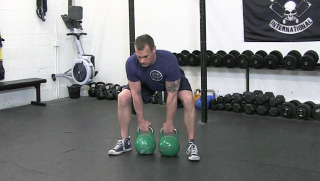 The double kettlebell deadlift is an intermediate level exercise that targets the lower body and back. 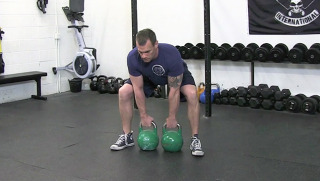 Start in a wide sumo stance with your ankles in line with the handles of the kettlebells. Push your hips back and keep your lower back flat as your lower yourself down to pick up the kettlebells. Grab the bells, press through the mid foot and stand tall, keeping your spine in a neutral position through the entire range of motion.